Las Vegas can feel quite plastic fantastic at times. It can make you wonder if there’s any true depth to a place grown up from greed, superficiality and showmanship. 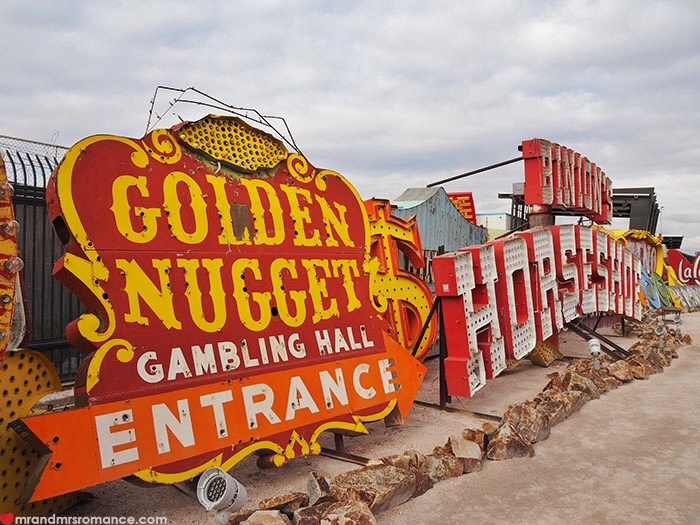 But if it’s culture and humanity you’re after, it’s the Neon Museum that holds the key to Vegas’s golden heart. We’ve both wanted to go to this museum for ages. 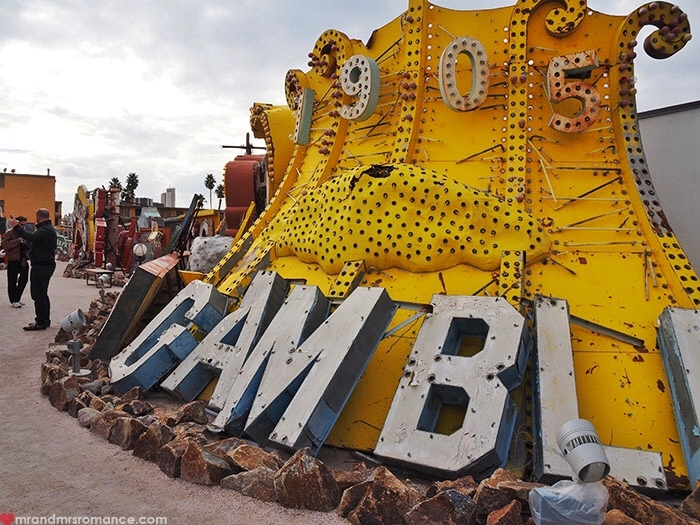 When Mrs Romance first showed me photos in a magazine of these creepy old decrepit neon signs discarded from old casino walls and motel standards, I was wrapped. Before we arrived, I anticipated a weird old scrapyard piled high with neglected signs, glass crunching underfoot and maybe a rat or two. I wasn’t all that surprised when my assumptions were way off the mark, and the place was clean, well managed and ordered, and much more museum-y than scrapyard-y. What I wasn’t expecting was the amount of love and care and human heart that’s gone into creating this museum. I know it’s a museum’s job to not only take you back in time and entertain you, but to also preserve what’s left. 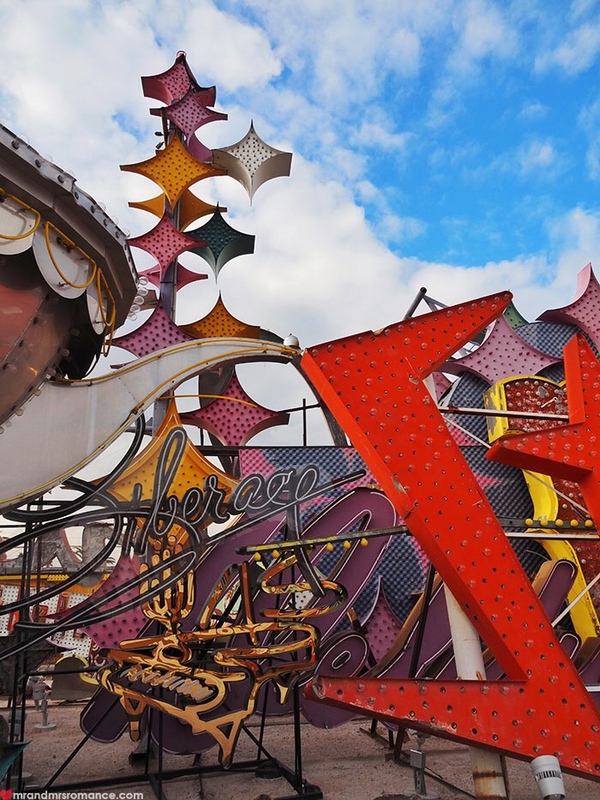 But the Neon Museum really takes it all a step further – especially for somewhere with a reputation like Vegas. 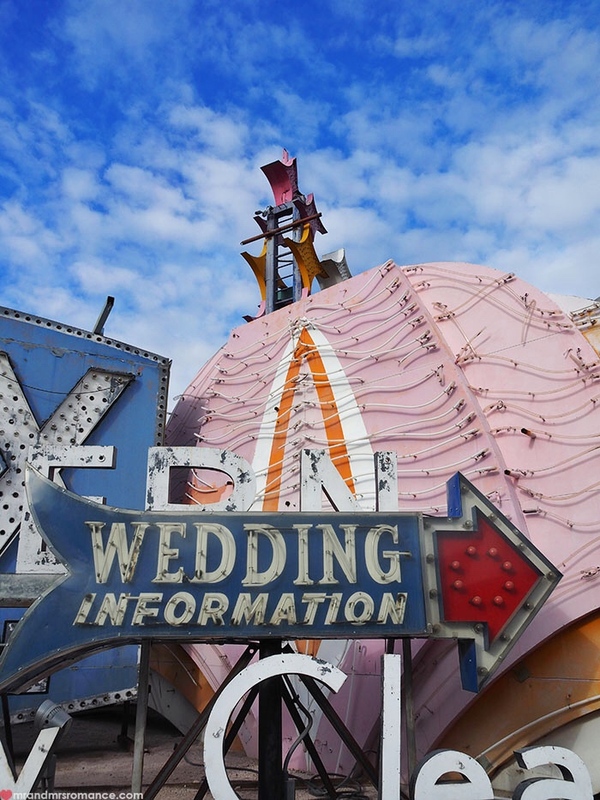 Even the main building and lobby is built from repurposed classic Vegas memorabilia. The roof and walls are from the historic La Concha Motel. 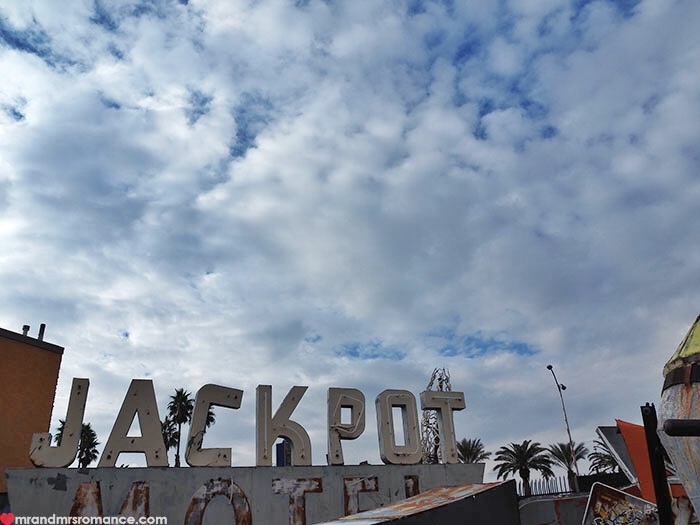 The motel was one of the last examples of ‘50s Googie or ‘atomic’ architecture. It was saved from demolition and donated to the museum 2005, and moved to its new, current site in ’06. And that’s what the museum’s all about. Our guide, Guy, explained how hard it is and how much money it takes to restore even the smallest of signs to its former glory. 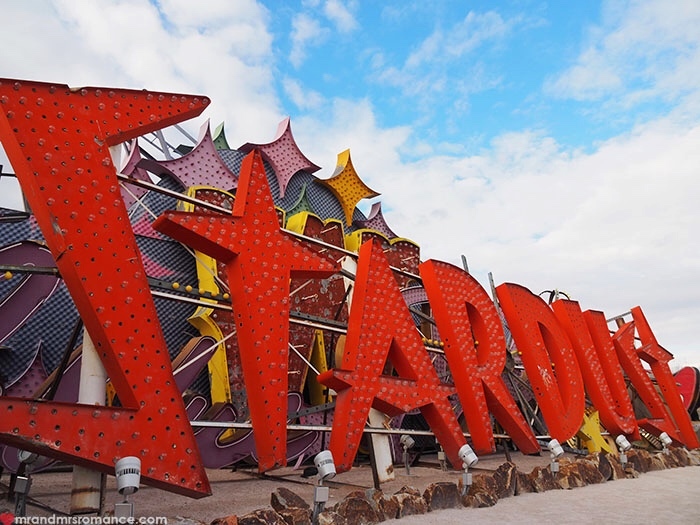 But everyone who works at the museum is truly committed to maintaining this important part of Vegas’s history. But why are all the signs there? 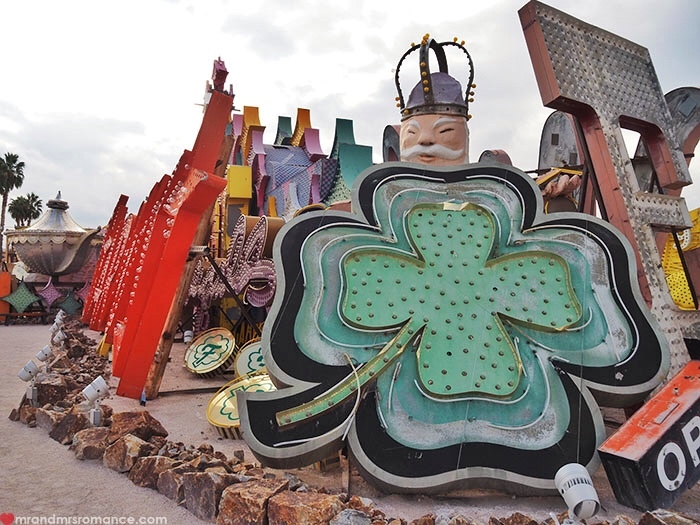 Vegas is and always has been one of the great examples of a disposable culture. When a business goes under, people don’t mourn its loss. There’s no quiet time before the next firm starts trading there. Everything’s ripped out, thrown away and new stuff comes in immediately. This is how it’s been since the beginning, when the mob first sprinkled their gold dust in the desert and the darling buds of Vegas pushed through the sands. It’s quite sad to see all these beautiful works of art – and that’s what they are – tossed aside to rust and decay. 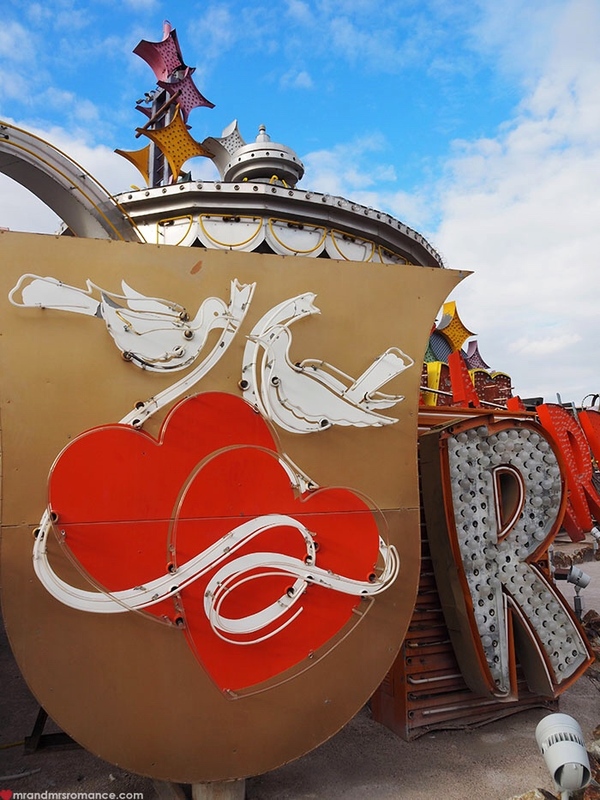 All hand made, all lovingly created, all symbols of their own epochs on the Las Vegas Strip. Tours can be booked from 10am – 7pm, 7 days a week. Book your tour through the museum’s website. 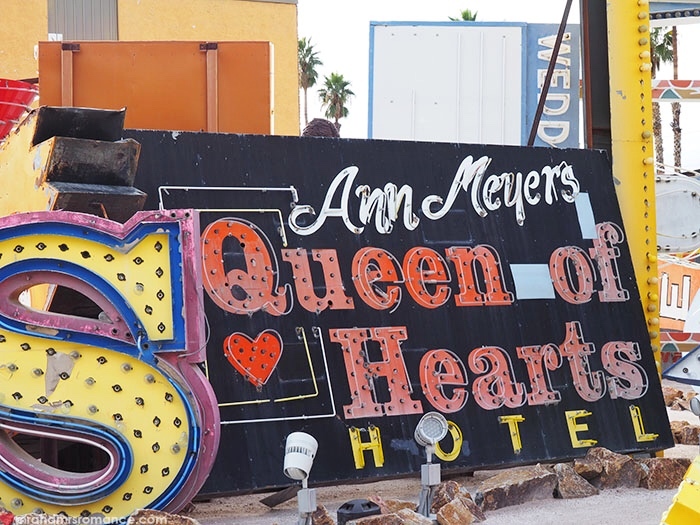 The Neon Museum is run mostly on donations and the public coming to visit. You’re only allowed to go in with a guide, who talks you through the collection and its history. Our guide, Guy, was great. So knowledgeable with a really dry sense of humour. Well worth the entrance fee. 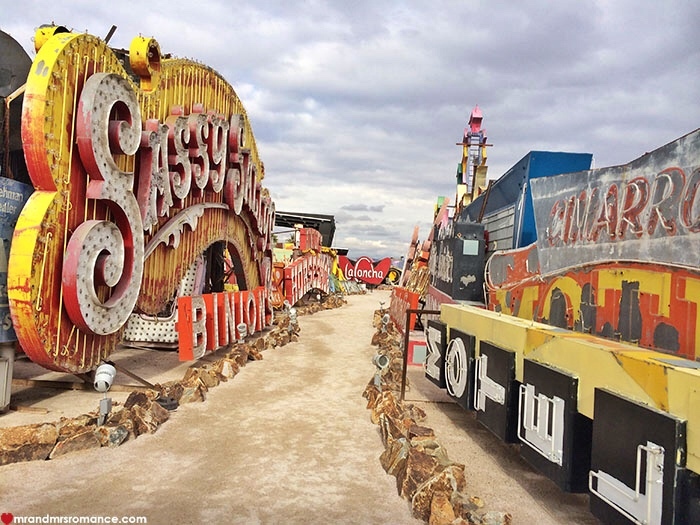 In true Vegas style, it’s also known as the ‘Neon Boneyard’, which I think makes it sound much more interesting. However, we went there with thoughts of just getting a good shot, but what we left with was a lot more than that. We left enlightened – and yes, I meant the pun! Have you been somewhere that totally changed your perspective on the place you were visiting? 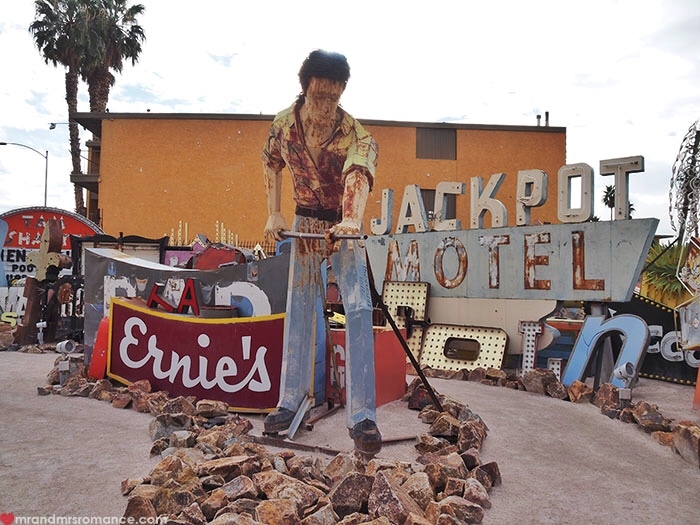 Do you think the signs of Vegas have any historic importance or are they just more old tack? Tell us in the comments! 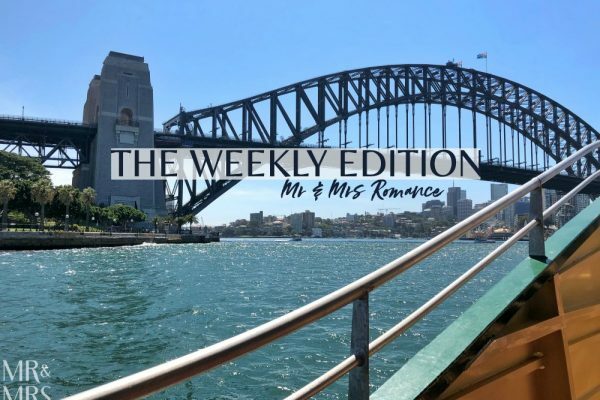 Images by Mrs Romance with our Olympus O-MD E-M1. 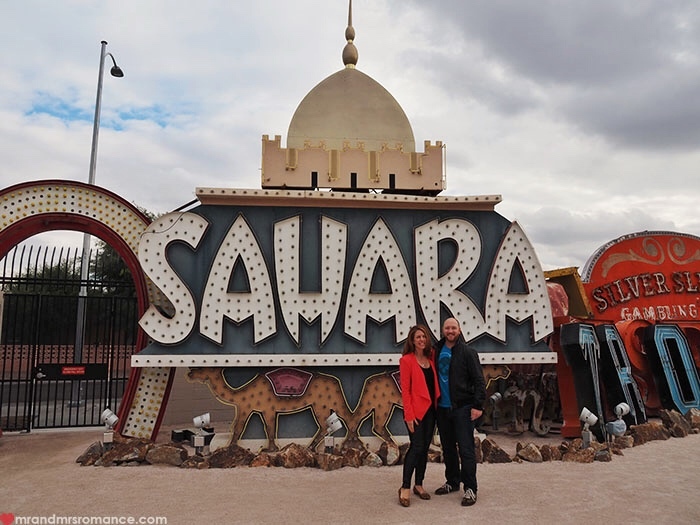 It’s important to remember that the Neon Museum does not allow photography for anything other than personal use. We’d like to thank the museum for giving us permission to use our photos on our site to tell you more about the amazing work they do at the museum. 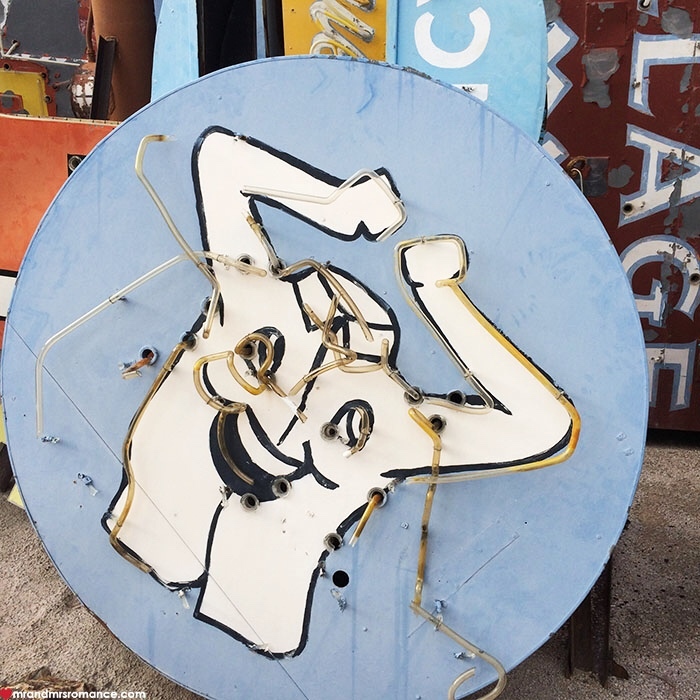 So many times I’ve been to Vegas now and a visit to the neon boneyard always slips through the ‘to do’ list. I’m giving it high priority this time, thanks for the review guys!! It’s really good, Daisy. Especially if it’s not too busy. You can see whether it’s going to be busy or not from their online booking system. Try and get there late afternoon or first thing. Seems to be the quietest times. 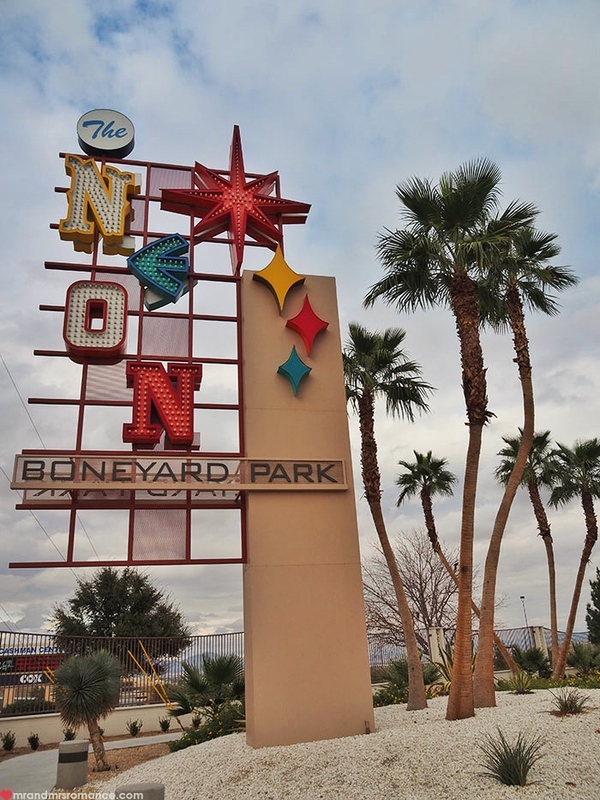 From the museum, it’s not far to the Container Park and then onto Old Vegas, both of which are good fun.